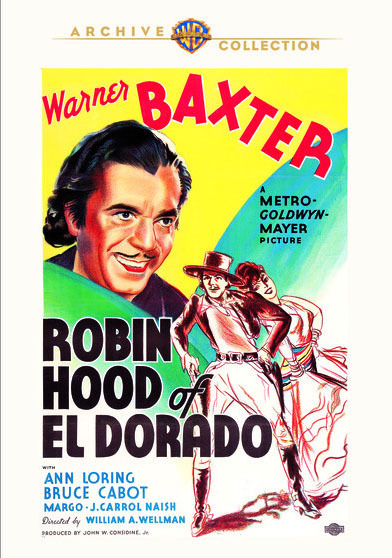 William A. Wellman's THE ROBIN HOOD OF EL DORADO (1936), starring Warner Baxter in the title role, has just been released by the Warner Archive. 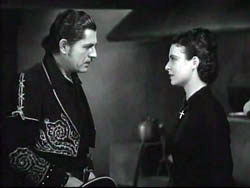 Wellman not only directed this film, he cowrote the screenplay, with actor Joseph Calleia being one of the other credited contributors. The script was based on a book by Walter Noble Burns. Baxter stars as Joaquin Murrieta, who is living a simple life as a farmer with his young bride Rosa (Margo) in the new state of California. Rosa is suddenly killed by "Americanos" who want Joaquin's gold-filled property, and Joaquin becomes a vengeance-seeking bandit. Unfortunately, Rosa's killing is just the first in a long line of terrible deaths, which continue right up until the moment before "The End" comes on the screen. It's the rare Wellman film I don't like, and I was expecting an exciting adventure tale of Old California, along the lines of THE MARK OF ZORRO (1940). Unfortunately, I didn't like this film at all, as virtually all of the film's sympathetic characters are killed. It seemed a pointless exercise in depression. Moreover, as much as I enjoy Warner Baxter in a film like 42ND STREET (1933), here he is plainly miscast. Wellman had wanted Robert Taylor as the leading man but MGM signed the 47-year-old Baxter, who looked even older due to the effects of alcoholism. In William Wellman Jr.'s outstanding new biography of his father, WILD BILL WELLMAN: HOLLYWOOD REBEL, it says solutions to the age issue discussed by Wellman and Baxter included surrounding Baxter with "older, less attractive character actors" and a "not too young leading lady." This latter idea doesn't seem to have been seriously pursued, as Margo, who plays Baxter's wife, was 28 years his junior, and the film's other leading actress, Ann Loring, was nearly 25 years younger. 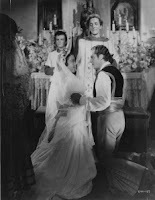 Baxter also had a younger screen double who, according to Wellman Jr., "was so adept at it that Baxter rarely appears in the film except in close-ups." Wellman Jr. says that stuntman Yakima Canutt was, in essence, doubling the double in some scenes! I found it interesting looking for which scenes might have been done by the double as I watched the movie. THE ROBIN HOOD OF EL DORADO runs 85 long and painful minutes. It was filmed by Chester Lyons. The supporting cast includes Ann Loring, J. Carrol Naish, Bruce Cabot, Soledad Jimenez, Eric Linden, Paul Hurst, and Harry Woods. The Warner Archive DVD seems a bit grainy at times but on the whole is fine. The DVD includes the trailer. A side note: The Archive box omits "The" from the title, but the opening credits read THE ROBIN HOOD OF EL DORADO. Another exercise in American guilt a theorem that may be fashionable, but which puts me off. 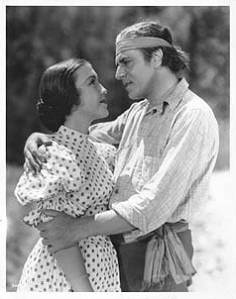 As for Warner Baxter, the romantic hero, always unacceptable. Delighted to read your post and I hated the picture.